By now, many New Year’s resolutions have become regrets since it’s very easy to find an excuse not to workout. For people who really want to work out, finding time can be nearly as difficult as picking a winning lottery numbers. It helps to make time and to enlist some professional help to assist you in reaching your fitness/ lifestyle goals. If it were easy, everyone would be in shape, right? Why not eliminate frustrations plus get the most benefit from your time and money by scheduling an appointment with a personal trainer? How many people do you know who have purchased exercise equipment from an info-mercial, only to realize the investment was in vain? How many buy workout system based on DVDs but never use them? After all, a home version of the Pilates reformer just collects dust if it is not used routinely. Meanwhile, a sense of failure develops, the pounds pack on as excessive snacking nourishes disappointment coupled with lack of exercise. Excuses and anxiety block the path toward success and positive change. Research has shown that you’re never too old or out of shape to start moving with regular and beneficial exercise. Even residents of long-term care facilities benefit in terms of strength, preventing falls and boosting morale. Exercise could be one of the keys in battling the epidemic of childhood obesity, staving off heart disease and perhaps Alzheimer’s disease and some forms of cancer. Exercise is frequently part of the prescription for treating depression. Many people find a particular form of exercise, Pilates, holds the key to achieving fitness goals. People who have mastered this dilemma commit to make their workout time a priority. Start by scheduling a consultation with a personal trainer. Forever Fit Foundation offers a complimentary assessment to help you get moving in the right direction. During a private interview, a qualified professional will address goals with the client. What do you want to accomplish? For many clients, a workout session with a personal trainer becomes a delightful mix of recreation and therapy. The trainer will also discuss costs and financial commitment. Decide which time of day works well with your personal schedule. Trainers meet the needs of their clients, so that might mean you’ll could be in at 5:30 a.m. on Monday or at noon on Wednesday. Most people find that working with a trainer maximizes their time spent in the Pilates room and in the gym. 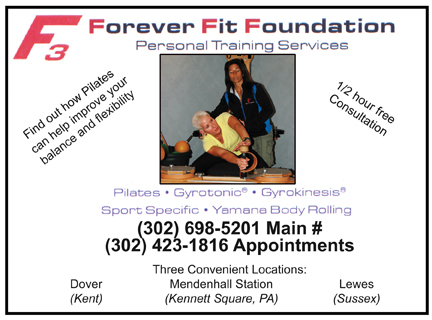 Forever Fit Foundation has developed a reputation of innovative personal training, training that meets you where you are and also helps you grow, and Pilates is as much a part of that as is strength training. Pilates is low impact and improves core strength, flexibility, and it helps develop long lean muscles and body awareness. Most people who have discovered the challenges and rewards of practicing Pilates realize that there is a tremendous advantage to having a skilled and experienced trainer not only to encourage, but also to provide variety and growth to your workout. The benefits of Pilates are achieved with precision, and some of the positions are quite complex. A trainer can assist in not only assuring that you are moving safely and correctly, but also modify exercises to meet your specific needs. Make an appointment with yourself as well as the trainer. Consider yourself a priority while you become the you that you really want to be. ← Previous Story Change Your Fate! Next Story → The Obstacle Is YOU!